Let’s hear it for Bernard F. McKay of Intuit (publishers of the popular TurboTax program) who was the one witness at yesterday’s hearing before the Senate Finance Committee’s Subcommittee on Fiscal Responsibility & Economic Growth1 who clearly stated the reality of identity theft. In other words, closing off access to the Social Security Death Master File (or SSDI as we genealogists know it) is not going to be any kind of easy fix to this growing international problem. 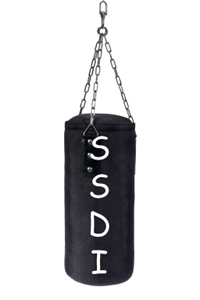 He didn’t say the words, but I will: it’s time to stop using the SSDI as a punching bag. McKay’s statement and those of other witnesses yesterday made it clear that identity theft and the filing of fraudulent tax returns is a huge business with enormous potential rewards for rings of organized criminals. He and other witnesses outlined the many many ways that identity thieves obtain the information they use to file fraudulent tax returns for hundreds of thousands of taxpayers — most of them living persons whose identities couldn’t have come from the SSDI. • An Arizona man who used stolen identities of disabled individuals to claim more than $1 million in bogus tax refunds. Notice anything about these examples? The victims were alive, not dead. I repeat: their information couldn’t have come from the SSDI. That didn’t stop some of those at the hearing from continuing to use genealogists and the SSDI as a punching bag. In particular, the sponsor of this bill, Sen. Bill Nelson (D-Fla.) kept mentioning the death master file and the availability of the SSDI to genealogists despite the lack of evidence from the other witnesses about its use in identity theft and despite the emphasis by the witnesses on tax fraud using information about living persons. So overall the hearing was better overall than last month’s House hearing — the focus there was on closing the SSDI completely9 — but our SSDI access is still very much at risk. As a community and as individuals, we need to stay on top of this. Even punching bags should know not to let down their guard. Thanks, Judy. I had been wondering how the hearing were going. Hadn’t heard anything til reading your blog. Sure wish the news were better, Margie, but at least it was better than the last hearing. Should have mentioned: remember the bumper sticker, “When guns are outlawed, only outlaws will have guns!”? When the SSDI is closed (or death records, or newspaper notices, or, or, or…) identity theft will still exist as is evidenced by today’s testimony. You absolutely have that right. Judy great posting and thanks for keeping us informed of what’s going on with this. My mother always accused me of being too practical (is there such a thing?). I don’t understand why no one will ask the 1 question that needs to be asked. Why are the government agencies not working together with their information? And why isn’t the IRS using the records to prevent fraud, rather than colluding to close the records? Good questions, all! Thanks for your postings on the hearings. If you are not aware, the OIG for the Social Security Administration (oig.ssa.gov) has been doing audits on the Death Master File since 2001 and been finding problems with living individuals on the file. If you go to the audit section of the website and search on “death master file” you can read the reports. The IG has testified to concerns about having the information in the file available to the public. Seeing the number of reports and management advisories they have issued I am surprised this issue has not come up before. It is not just an IRS issue. I used to work for an IG for another agency and they have a lot of influence on the Hill. Thanks for that reminder, Jean. Of course, closing the index to genealogists won’t cure the problem of inaccurate info on living people since credit agencies and banks will still have access.